Now, in addition to a backyard with trees such as holly and white oak, and butterfly favorites such as Joe-Pye weeds and Virginia sweetspire, he’s got a front garden blooming with spring wildflowers such as bloodroot and Mayapple, a small pond next to the garage with wetland species such as Blue Flag iris and scouring rush, and, on the roof of the garage, he’s experimenting with species native to the state’s Shale Barrens. “Now I’m seeing insects I remember from when I was a kid,” says Janick, who grew up in the Poconos. The Spruce Hill Community Association, in West Philadelphia, has been rehabilitating a plot of land it owns east of South Melville Street near Locust to provide bird habitat. Tucked in the interior of the block, this land had been informally known as the “bird sanctuary” by neighbors, according to association member and landscape architect Anne Froehling. In 2010, the association added bird feeders, a bird bath and a water mister, and started planting native shrubs and trees that birds are attracted to, including holly, river birch and elderberry. There are at least three programs that can help guide homeowners to create their own wildlife habitat. 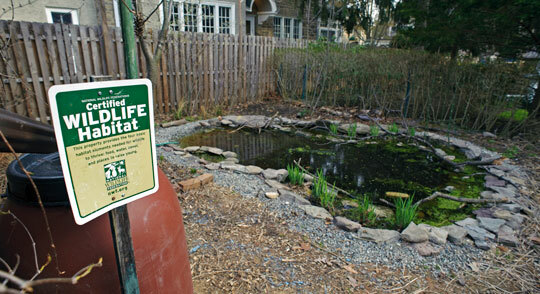 The National Wildlife Federation’s Garden for Wildlife program has been educating homeowners about how they can improve the environment around their house and certifying yards based on native plants and other habitat features since 1973, and has reached more than 170,000 properties nationwide, with 2,882 in southeast Pennsylvania and 190 in Philadelphia, according to Claire Megginson, Senior Manager, Constituent Systems. To gain the Wildlife Habitat Certification, homeowners create a profile through the federation’s website, add in habitat types and habitat elements, pay a one-time fee of $20 and wait for approval. Audubon Pennsylvania started Audubon at Home in 2007, and since then it has recognized 700 properties for good land stewardship and sustainable yards, emphasizing the habitat needs of our native birds, according to Steven Saffier, director of Audubon At Home program. This year they added a Healthy Yard pledge for homeowners just getting started, a way for homeowners to work with Audubon as they are converting their properties to better habitat. For resources specific to Pennsylvania, people can visit pa.audubon.org, where they can register, take the pledge, or learn more about Audubon At Home and Bird Town (another Pennsylvania-specific Audubon program). Penn State’s Master Gardeners created the Pollinator Friendly Garden program two years ago to support our native butterflies, native bees and the less-charismatic insects that make sure our flowers get fertilized. “The common lawn is useless to pollinators,” says Connie Schmotzer, consumer horticulture educator with Penn State Master Gardeners. “The program is meant to be educational. If someone receives certification we want them to be an example to others,” Schmotzer says.